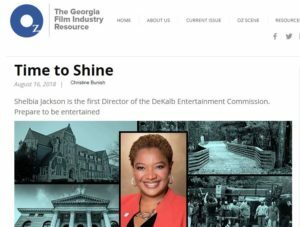 The DeKalb Entertainment Commission will offer a “Powerful Pitch DeKalb Workshop” on Saturday, October 13, 2018, from 9:30 a.m. to 1:30 p.m., at DeKalb County’s Oakcliff Studios (3400 Oakcliff Rd., Suite 106, Doraville, Ga 30340). Whether you are a novice or professional at pitching film/tv projects, this workshop will help participants elevate their success in connecting with industry professionals who can help advance careers. 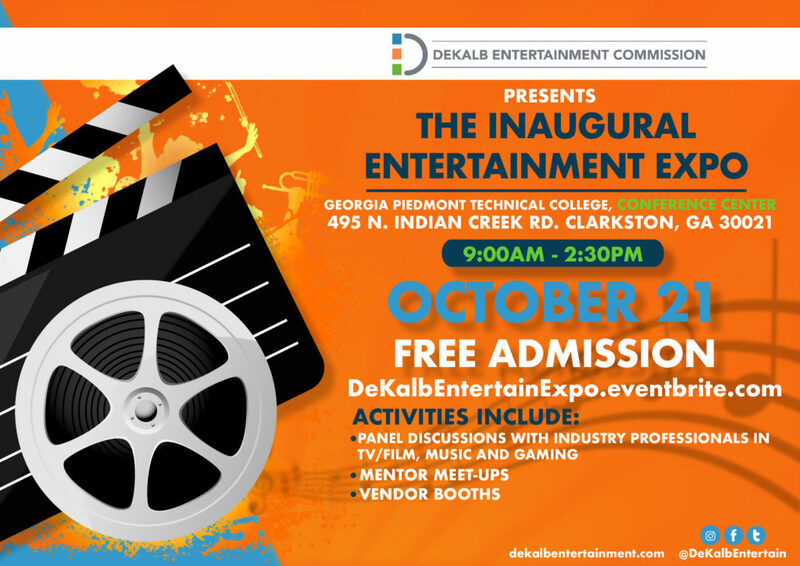 DECATUR, GA — The DeKalb Entertainment Commission will host its second Entertainment Expo on Saturday, November 3, 2018 from 9 a.m. – 3 p.m. at ROAM Innovative Workplace at Perimeter Center, 1151 Hammond Drive Northeast, #240, Atlanta 30346. The event features resources and information for DeKalb companies, professionals and residents seeking to build a presence in the entertainment industry. In the Sept. 28, 2018 edition of the Decaturish Podcast, editor Dan Whisenhunt talks with Shelbia Jackson, Director of the DeKalb Entertainment Commission! Tune in to learn how you can be a part of the film, TV, music and gaming industry! CEO Exclusive Radio: DeKalb Entertainment and City of Tucker! 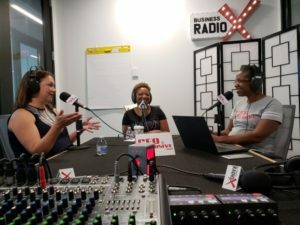 DEC’s Shelbia Jackson and Sonja Szubski with the City of Tucker were the guests this month on Soyini Coke’s CEO Exclusive Radio Show! Shelbia talked about DeKalb’s efforts to create opportunities for local residents and businesses to be a part of our region’s booming entertainment industry. She talked about all the resources offered, including classes and workshops in film, television, music and digital entertainment. Sonja talked about all that the City of Tucker is offering to its residents and film productions. And click on this blog piece: http://www.ceoexclusiveinsights.com/blog-post/get-your-slice-of-a-new-industry/. Author DeKalbPosted on September 5, 2018 September 6, 2018 Leave a comment on CEO Exclusive Radio: DeKalb Entertainment and City of Tucker! Oz magazine reports this month on the growth of the DeKalb Entertainment Commission under the guidance of Director Shelbia Jackson. “DeKalb County creatives and businesses supporting film, television, music and digital entertainment have a new friend. Shelbia Jackson has been named the first Director of the DeKalb Entertainment Commission (DEC). Launched last year, DEC is charged with attracting and expanding the entertainment industry in Georgia’s third-largest county. 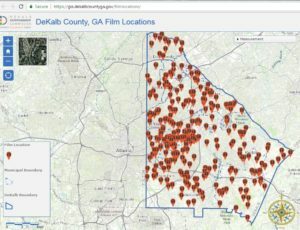 DeKalb homeowners and businesses can now showcase their properties as potential locations and location scouts can easily secure locations and permits through a new online resource created by the DeKalb Entertainment Commission. The online portal is accessible at DeKalbEntertainment.com and via any mobile device. Author DeKalbPosted on August 1, 2018 August 1, 2018 Leave a comment on LiveStreaming, Shoutcasting and eSports! DECATUR, GA, July 2, 2018 — The DeKalb Entertainment Commission has announced its summer and fall schedule of classes and workshops for residents and businesses. Topics cover film, television and digital entertainment. ATLANTA, June 27, 2018 – Shelbia Jackson has been named Director of the DeKalb Entertainment Commission (https://dekalbentertainment.com). 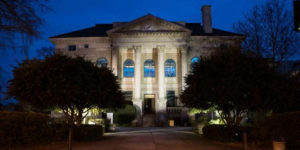 The Commission is the primary driving force charged with attracting and expanding businesses supporting the film, television, music and digital entertainment industry in DeKalb County. 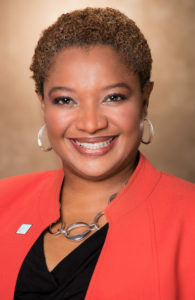 She had previously been a Project Coordinator with the Decide DeKalb Development Authority (DDDA), the county’s economic development department. T he DeKalb Entertainment Commission (DEC) this week released the results of baseline research it’s conducted on the economic impact of the entertainment industry in the county. The numbers already show a positive impact of $1.98 billion in 2016 and a 12 percent growth in industry jobs from 2011-16. The Commission estimates that every job created locally in the entertainment industry generates 1.45 additional jobs in other areas. A number of job categories saw growth, particularly in motion picture and video production and positions for independent artists, writers and performers. Since its launch in 2017, the Commission has been creating more effective systems for connecting with local businesses in film, television, music and digital gaming. DEC is building opportunities for collaboration, while supporting the creation of opportunities for DeKalb residents to participate in this booming entertainment industry. It is estimated that this strong growth will continue as the Commission offers workshops and training for local business, educates residents on available opportunities, and networks with key industry players. The report showed that 5689 jobs generated an additional 8711 jobs. Even with these impressive numbers, the Commission says this initial baseline is very conservative.